I had a table at the latest Portland Comic Book Show this past weekend. First time. It was a lot of fun. I met many new people and a couple of old acquaintances, sold some original comic pages, did a ton of free sketches for the kids who stopped by, and also did my first live commissions at a show. After this experience, I’m pretty sure I’ll get a table at the Emerald City ComiCon coming this spring in Seattle, and probably do the Portland one again next fall. Here’s one of the pieces I did that day. I’ll post some of the other ones I took photos of soon. 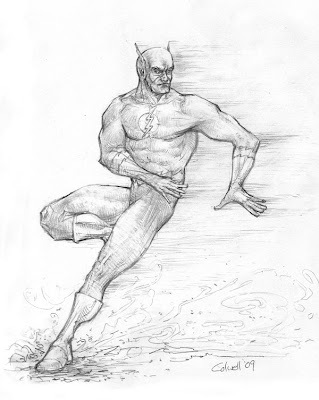 Flash sketch for the Ten Ton Studios sketch challenge. Yes, I know I’m years behind the curve on blogging, but I want someplace to throw some of my sketching. I’ll try for a few updates a week, at least one a week. I’m currently working on re-educating myself on figure drawing since that is my biggest weakness and most potentially lucrative skill.